Ramsons, or wild garlic, is one of the first wild greens emerging as soon as snow melts. It is rich in vitamins and minerals which are so needed by all of us in early spring. It was traditionally used in Europe and North America as a food and a medicine. You can forage young ramsons in parks and established woodlands for a short period of time in spring, so do not miss a chance! Ramsons wilt quickly. Put them in a bowl of cold water as soon as you get home. Boil eggs for 10 min. Strain hot water out and place the eggs under cold running water to cool them quickly. Wash ramsons and scallions thoroughly and pat them dry with a towel (never put wet greens in your salads). Chop ramsons and scallions very finely. Combine with chopped eggs. Garnish your salad with Homemade Mayonnaise, a little bit of Dijon mustard and salt and pepper to taste. The proportions if ingredients are the matter of taste. 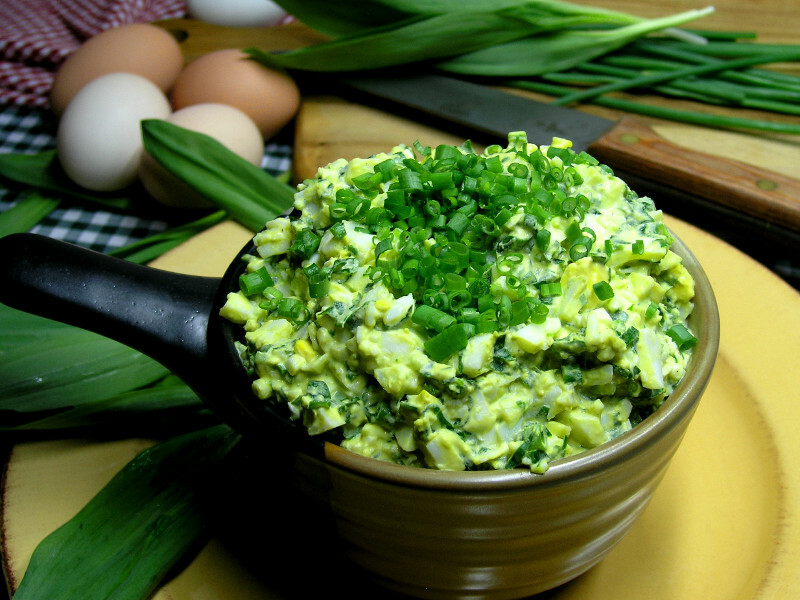 Don’t worry, you cannot spoil egg salad.